Remember the ’90s, when big-box retailers rampaged across the U.S., putting bookstores, clothing boutiques, electronics stores and small groceries out of business? Well, some of those mega-retailers ran out of steam: Borders Books and Music turned its last page in 2011; Barnes & Noble is teetering on the brink; Circuit City shorted out in 2009. Most recently, Office Depot bought OfficeMax, then the whole shebang was purchased in February by Staples, considerably cutting the number of players in the office-supply sector. 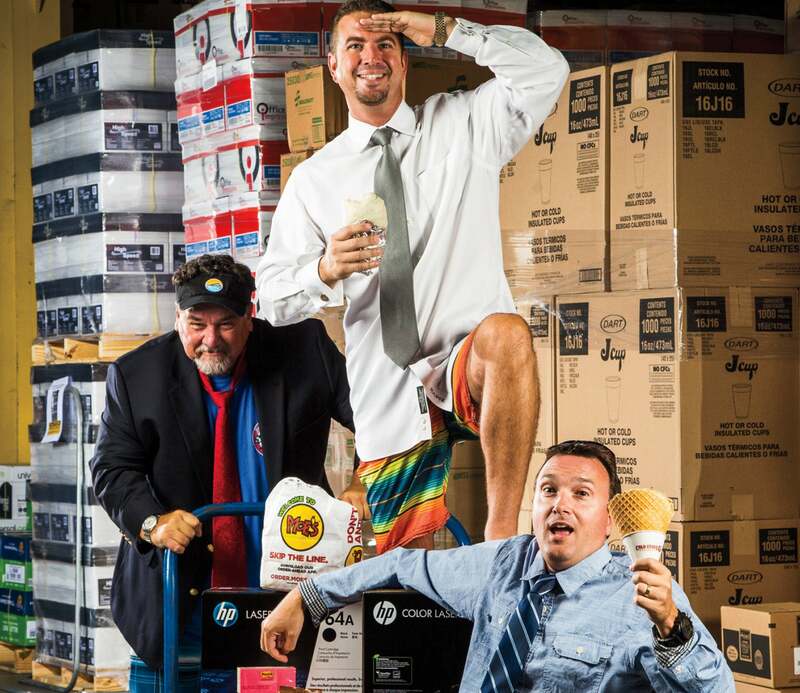 But Darin Kraetsch, Alan Woods and Brian Curin, founders of the popular franchise brand Flip Flop Shops, were ahead of the curve. In 2012 they launched an online office-supply portal called OfficeZilla. Soon United Stationers (recently rebranded as Essendant) -- a distributor with a $750 million office-supply inventory and 30 U.S. warehouses -- came calling. Together they turned OfficeZilla into a franchise, one that marries new technology with good-old, pre-big-box customer service. Goofballs with gear (from left): Darin Kraetsch, Alan Woods and Brian Curin of OfficeZilla. E-commerce leads from officezilla.com are fed to local franchisees, who follow up with businesses to help them buy the right products -- from pens and folders to janitorial supplies -- in the right quantities. The model has attracted 19 U.S. franchisees, with more on the way. Kraetsch set aside a few moments to tell us how OfficeZilla’s tech is taking the pain out of making supply decisions. What does personal service have to do with office supplies? A lot of times the person doing the ordering for a business is doing it for multiple locations or departments. There are a lot of lists to manage. Where the franchisee comes into play is coaching that person, helping them find the best way to organize the account and create sub-users that they can monitor. They can look at a list of invoices and point out things like a toner that is becoming hard to find and expensive, or that they’re buying file folders each month and it would be cheaper to buy them in bulk. We’re able to give small businesses the type of service they would get from Staples if they were big enough. It goes beyond just buying Uni-balls. When we started OfficeZilla, we wanted to be a straight e-commerce company. When Essendant met with us, they asked if we had thought of franchising, and to be brutally honest, I said I hadn’t and didn’t understand how that would be possible. They edu- cated us on how we could use the tech side to drive business to a strong customer-service-based franchisee model. What kind of franchisees are you looking for? Really, we have a bifurcated plan. We’re going after traditional sales professionals across the U.S. But we’re also targeting existing office-supply dealers who are looking to grow. The big-box stores have only 35 percent of the industry but 90 percent of the mindshare. There are thousands of independent dealers, and what they are challenged with today is the technology side of things. Independent dealers have high-touch relationships with clients; however, they have to adapt to the changing business. We’re putting ourselves out there as a solution for them. We do our best to give them that technology support so they can do what they do best, which is develop relationships and sell products. Can OfficeZilla do for office supplies what Flip Flop Shops did for sandals? Yeah, the office-supplies industry has never demonstrated a lot of personality. It has always been something very perfunctory. We are really focused on our brand itself. OfficeZilla is refreshingly fun and mildly irreverent. On our website, one of our slides is one of our people making out with a big roll of bubble wrap. We want to bring a little emotion to office supplies and make customers smile or roll their eyes. We want to do everything we can online to build a relationship that our franchisees can then continue.